Boneless Crispy Pata. I was watching a video of an episode of Delicioso hosted by Sam Oh and Jackie Ang-Po, the guest cook is no other than the amusing Chef Boy Logro. 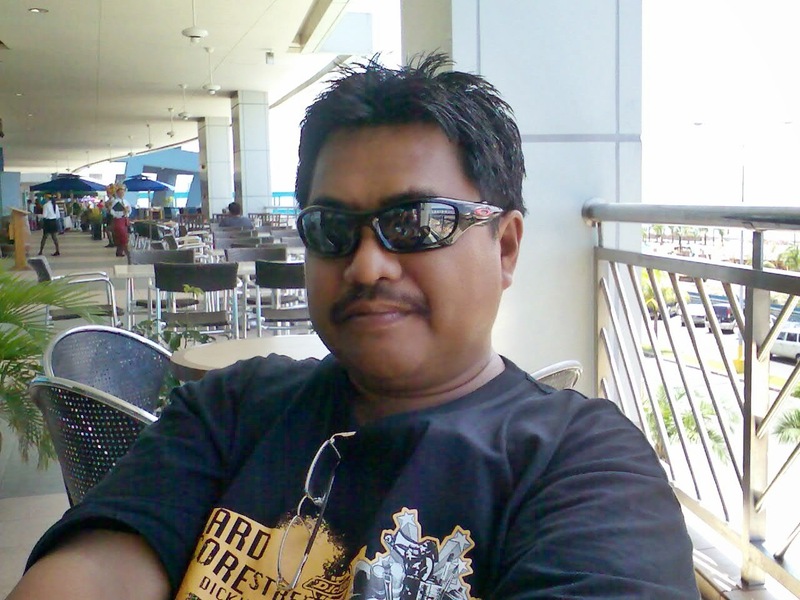 On the video Chef Boy Logro explain how to debone a pork leg. Click here to see that Delicioso Video Then I got inspired to make a simple boneless crispy pata that I could share. I know it’s not easy to debone a big pork leg. Here is a better and easier way to debone and cook boneless pata. You would not need all those methods that chef boy Logro explained in the video, it is however important that you watch the video to learn how to debone a pork leg. For my method select a moderate or small size pata. Ask the butcher to cut the pork leg in two at the joint, cut and discard the ends where the nails are. If you wish you may keep it for other use. Now that the pork leg is cut into two pieces it is easier to debone and of course cook. When the pork leg deboned, straight away boil it till tender with the aromatics and generous amount of salt. Do not bother wrapping it with cloth, during boiling the pork leg will spring back to shape. Boiling is somewhere between 1 to 2 hours but do not overcook we don’t want the skin to disintegrate. See my previous post of crispy pata. Before frying using a fork prick the entire skin, do not worry of over doing it, prick as close as possible similar to the Lechon Macao recipe. Fry in hot oil otherwise it will stick to the bottom of the frying pan. Big WARNING though expect a lot of oil splashing. 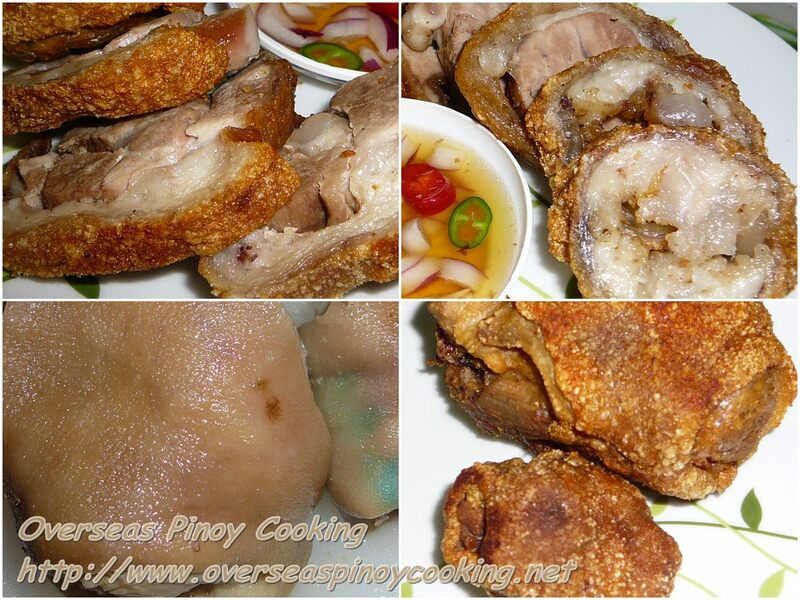 Here is the recipe of my Boneless Crispy Pata, again watch out for those hot oil. Wash pork leg and place in a big pot. Add Sprite or 7-up and enough water to cover the pork leg. Add 3 tbsp. salt, peppercorns, garlic, bay leaves and soy sauce. Cover and bring to a boil, simmer for 1 to 1 1/2 hours or until tender. Remove all scum that rises. Remove pork leg from the pot and place in a colander and let sit for a while so the liquid will drain. Dry with paper towels if necessary. Keep refrigerated for several hours. Before frying using a fork prick the entire skin as close as possible. In a large wok heat enough cooking oil and deep fry leg until golden brown, turning occasionally and blisters starts to appear on the skin. Drain on paper towels. Slice crispy pata into rings and serve hot with a choice of dipping sauce. Wow ang sarap naman niyan! Wala pang bones, It's good for no fuzz eaters, mas mapapadami kain ko niyan. i dn't think adding 7up or Sprite is advisable. i have tried once but it only make my pata look dark even if the fire was low. I agree, the sugar on the soda drinks makes it a litle bit darker. Yes I might need to make another recipe for this one.